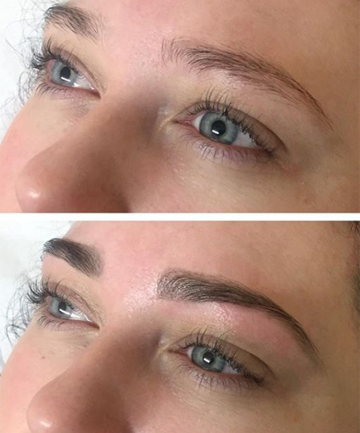 Tinting your brows a shade or two darker will help enhance your natural shape Eyebrow tinting might seem a little scary to some people — after all, your brows are smack-dab in the middle of your face. What if you don't like the color or if it's too dark? Experts swear by the semi-permanent procedure because, unlike tweezing, waxing or threading, tinting doesn't involve hair removal at all. In fact, its main purpose is to give you an even fuller brow. "Since texture naturally changes throughout eyebrows, the tint picks up and adds definition to the finer hairs," explains Fisher. And don't worry — it's not permanent. "Eyebrow tint should gradually fade over the course of three weeks," says Fisher. If you're looking to make your tinting last even longer, avoid harsh cleansers or swimming, which can lessen the pigment.